Blondie's Dolls Interview on Show Me St. Louis - February 19, 2019 Blondie's 93rd Birthday! Thurs - Sun, Feb. 21-24. Come in and sign Blondie's Birthday card! obil Toys, Kӓthie Kruse dolls and toys, Hermann Collectible Bears, and doll clothes for 18" Dolls, 15" Baby Dolls, 13" Baby Dolls, and Barbie. See the NEW Playmobil Dinosaurs, Aquarium, Camping Sets, and Wedding, plus the wide-ranging line of Playmobil doll houses, princess, farm, treehouse, horse sets, police and fire, vehicles and trucks, pirates, airport, and more! Visit Blondie's Dolls for handmade American Girl and Barbie clothes, Käthie Kruse dolls and toys for infants and up, and Hermann Bears from Coburg Germany. 1st Prize: : 18” doll and western outfit - shirt, jeans, hat, boots - and the horse. Tickets are available in Hermann at Time for Memories, Headhunter Salon, Blondie's Dolls, and at Trailside in Rhineland. Tickets are $1 each or 6 for $5. Raffle ends May 28, just in time for Horsin' Around Fun Show on June 2 in Rhineland MO. Shop Hermann for your Easter Basket! Blondie's Dolls and Espresso Laine's are working together to provide the best possible shopping experience to fill your Easter baskets! We have a huge selection of toys and gifts for all ages and price ranges. As a special gift, you will receive 20% off all Regular priced items you can place in the bright aqua and lime green tote that is available at both shops. Come in and complete your Easter baskets at Laine's Espresso and Blondie's Dolls! Come in and Celebrate Blondie's Birthday this weekend, Feb. 23 and 24. Meet Blondie 11AM to Noon on Saturday. Refreshments! Visit Blondie's Dolls Soon! Located in the beautiful, historic German community of Hermann MO. These quilts, each approximately 18" x 24", have been lovingly created by Blondie and daughter Janet. The quilts were machine pieced and hand quilted by Janet and bound off by hand by Blondie. They are both backed by light blue minky. $30 ea. This gracious young lady is wearing a boiled wool embroidered jacket and matching bonnet with bustle skirt with ivory lace trim. She has black lace-up boots to complete her vintage 1870's outfit. This doll and outfit are for collectors and not intended for play due to the delicate materials used. Doll & Outfit $60. Blondie's Dolls now has handmade doll bed quilts. These 2 already have a home, but more will be coming! These are approximately 18" x 24" - the aqua butterfly with embroidery trim, and the 'clouds' version of a 9 patch. Very Important Visitors on a cold January Day! Blondie's Granddaughter, Johanna, and three Great-Grandsons, Sam, Grant, and George visited the shop on Saturday! Note Sam has ice cream - it is never too cold for the Deli's Ice Cream! And even George, not quite two years old, loves Playmobil! extend the sale through the end of January! These are the handmade 18" Doll outfits that will be available at the Christmas Vendor Market, Dec 7 - 9, 1 - 4:30pm. We will be closing the shop early today, at 12 noon, to be at Starkenburg, but will reopen Friday 10 and be open at both locations for Friday and Saturday. Just in time for Christmas there are a dozen new 18" Doll outfits in our front window along with some old favorites. Come in and see these and many more located around the shop. Also come see our Booth at Spirit of Christmas at Starkenburg Dec 7-9, 1-4:30PM each day. We will have new outfits there along with Playmobil Christmas toys and decorations. Come by Blondie's Dolls to see this beautiful painting on the step to our south entrance door. Karen Steiner, Time for Memories at 207 Schiller, painted this beautiful basket of iris and other flowers for Mom. You have to see it to believe how beautiful it is. We cannot thank you enough for this wonderful gift, Karen. Celebrate the Total Solar Eclipse with our colorful embroidery patches. Available now at Blondie's Dolls! had a great stay and please come back soon! Come visit Blondie, see her dolls, and explore the new Playmobil Land on Schiller. This new play area is sized for 18 month old and up! The updated play area includes the new Take Along Farm with lots of friendly animals including a cat, a dog with its own house, a cow, pig, dove, the farmer, a table and chair for any of them to use, and sorting feed bags for additional entertainment. The area also includes the new Night Train with Engineer, family, packages, an engine, 2 cars, and track. The Airport Shuttle has the driver, 3 passengers, and their luggage which stows neatly in the shuttle luggage bins. The favorite 'Countryside' is back with people, cat, dog, rabbit, cows, sheep, flowers, bridge, and even a horse with cart. We also have available the New Petting Zoo, Farmer with Tractor and Trailer, Ladder Unit Fire Truck, Lady with Cat, Farmer with Wheelbarrow and Chicken, Recycling Truck with Sorting, and Truck with Garage and sorting, all sized for 18 month old and up. We continue to have the Take Along Noah's Ark, Take Along Zoo and Aquarium, and a smaller Take Along Farm. We are pleased to announce the Winner(s) of the raffle! We had such a successful raffle that instead of the one doll, cowgirl outfit and horse as a prize, we have 3 prizes and 3 winners! First Prize - Elaine Horton wins the horse, 18" doll, and cowgirl outfit of her choice. Second Prize - Robin Ackermann wins an 18" doll and outfit of her choice. Third Prize - Larry Englert wins an outfit of his choice! The winners will be notified and can pick up their prizes at their convenience. Fabulous Friend, Debi Noelke, helped mom kick off the First Year Celebration with her beautifully decorated cookies. She made dolls, tulips, hearts - all beautiful and delicious to make our day even more festive. Thank you, Debi, for making mom's day so special! Visit Blondie's Dolls to see the new selection of colors and varieties of shoes for Spring for American Girl / 18" Dolls. Everything from Cowgirl Boots to Polliwog Sandals, Saddle Shoes, Water Shoes, Sneakers in multiple colors, Bunny and Polar Bear Slippers, Boots, Soccer Shoes with socks and a soccer ball, Dress Shoes, Ballerina Polliwog Sandals with Fancy Flower and Rhinestone decoration, Ice Skates, and many others. Come in soon for a better selection! VERY SPECIAL VISITORS to Blondie's Dolls! On Saturday, March 18, Megan, Ava, Zoe, and Faith visited Blondie's Dolls. They enjoyed the doll display and I believe really enjoyed the American Girl Shoe Sale! Thanks so much for visiting. Blondie's Dolls had a great time at Starkenburg Spirit of Christmas 12/7 - 12/10. The Country Store in Valentine Hall was a good attraction for visitors who came to hear the Spirit of Christmas music program. Thank you to Debi, Denise and Ava for representing us there so we kept the shop open too! Blondie's Dolls had a very special group of visitors on Saturday, Oct. 15. 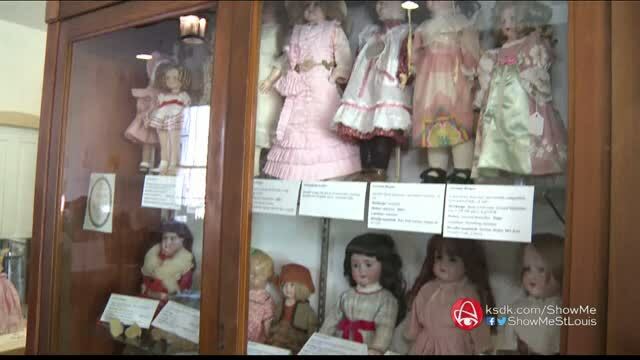 A group from St. Louis Miniature Museum enjoyed the doll gallery, lunch, and an overall fun day in Hermann. Blondie is a Charter member of the organization and was quite excited to have them visit. They also celebrated a birthday - lady wearing the crown on the left side of the photo on the right - with a kazoo rendition of Happy Birthday and then honored mom with the same rendition for her past (February) or next Birthday. We were not quite certain which. Blondie Haeberle always loved dolls and began seriously collecting after her first granddaughter, Johanna, was born in 1977. When combined with the dolls of her family, she has accumulated over 1000 dolls and is now sharing them with the public. The Doll Gallery has over 500 dolls to view, and the Gift Shop includes collectible bears from Germany, Playmobil toys headquartered in Germany, paper dolls and books for old and young alike, and doll clothes and accessories for American Girl and other 18" dolls. Blondie's Doll Gallery & Gifts is open. Come see us at 201 Schiller, Hermann, Missouri.